A surprising Google Desktop gadget released by Google enables you to share your media across devices. "Google Media Server uses an open technology known as Universal Plug n' Play to stream media to consumer electronic devices. The UPnP specification allows for a variety of hardware (gaming consoles, set-top boxes, photo frames) to communicate and access media from your home PC." The Windows-only gadget lets you share all the media content indexed by Google Desktop or just the files from some of your folders. Google Media Server can also share some of your Picasa albums (from your computer or from Picasa Web Albums) and the videos uploaded to YouTube. Google's application requires to authorize the devices that are allowed to access your files, but there's an option to allow any device to access the Media Server. Google Desktop's blog mentions PlayStation 3 as an example of UPnP-enabled device. Google Media Server's team says that "the only way to connect the XBox 360 to a UPnP server, was to have a service that is only found on Microsoft services (used for registering for DRM content) and for the server itself to be claimed to be made by Microsoft. Legal would not allow us to pretend to be Microsoft (although there are other servers out there that do)." This is a very interesting way to use Google Desktop: streaming media files that are stored online and on your computer. A recent YouTube blog post mentioned a list of devices that enable you to access YouTube from your living room and Google Media Server is another step in this direction. If you manage to connect the application to one of your devices, post your feedback in the comments and use the Media Server Group to ask for help. All set up on my computer - but how do I actually access materials on my device (in this case, my Moto Q)? Evolving from this Google Desktop program, Google Media Server will be available in a few years, running on Windows or Linux. "If you manage to connect the application to one of your devices, post your feedback"
joking aside, I think the system uses UPnP. (Universal Plug-and-Play if I'm not mistaken) This feature is standard in almost every modern day router for instance. Basically any device that is ethernet enabled and authorized to get an IP from your DHCP will make the cut. As for Moto Q, I don't think it has UPnP enabled, and surprisingly, this is one of its "fail"s that has nothing to do with how bad a product it is. I think UPnP is a lot more resouce hogging for that size of electronics. 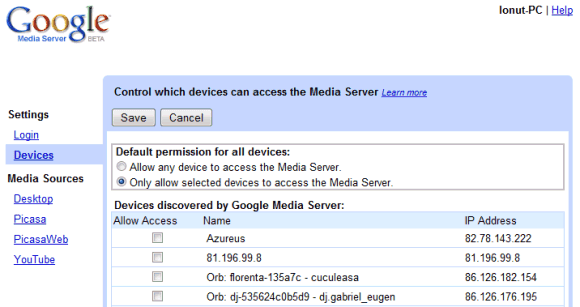 Is it possible to use Google Media Center with a Wii ? Hi, I am a noob here. I have few questions on how exactly does this work? I first install Google Desktop on a Windows system and run across few folders. Then, I install this Google Media Server tool. The Media Server tool then talks to the Google Desktop to get the files and folders that it needs to stream. Then, I connect to the Media Server. Is my understanding correct so far? If so, then my next question is, How do I connect to the Media Server running on my Windows PC? Do I need to install some sort of tools even on the "client" devices? My clients probably would be a PSP or a N800. of your PC running GMS) but you will get the message forbidden in the corner so I wonder if you can acess GMS this way anyone have any ideas. Tried on PS3 and working well. Only downside seems to be the youtube streaming not dealing with a slow connection and hitting buffer problems. Other than that a big thanks. You should check out SimpleCenter which can handle most of these things too. "and for the server itself to be claimed to be made by Microsoft. Legal would not allow us to pretend to be Microsoft (although there are other servers out there that do)." has anyone compared the connectivity from a ps3 with that of tversity? does it differ if you're connected to the google media server vs. tversity's? Any advise to get this to work between my desktop and media lounge? i beleive it is a full upnp device but also might be thinking its a port forwarding thing. I normally use widows media player for the server and it works well, but would like to find replacements that are FREEEEE. I'm using Opera Internet Channel in Wii to access youtube directly. It is working very well and very good quality. Any idea how this system compares/contrasts to the stuff from DLNA (Digital Living Network Alliance)? I have DNLA aware TV (Samsung) - will the TV use the correct protocol and see the GMS? Have a look at TVersity people. Its the finest free Media server out there. Well I'm seeing this as a potentially promising program However Google really lacks in the ability to describe how it works. Not only can't you get the answers you need here, you can't get them from Google either. maybe they made the thing but they don't even know how it works either. Why make something if you can't even supply proper instructions for it? BIG waste of time. Is this available to work with ps2? can I rightclick a dabghi? My You Tube is not showing my favorites and when I go to Picasa Web to view my pictures it say the file cannot be found, that it must have been removed from the server, but it shows them anyway. And You Tube is very slow. Is there anything I can do to rectify these problems. I would like to use this. I have IPTV at home with a wireless router(ethernet-enabled). I wish to make my router connect to my laptop(which has Google Media Server on it).That means my Google Media Server must recognise my .Also my TV is connected to the wireless router via the Service provider's STB.So can i view youtube and other websites on my tv coming from my laptop via STB?